For complete protection against fire and carbon monoxide, the Kidde KN-COSM-IBA hardwired talking combination smoke and carbon monoxide alarm with a backup battery is the standalone for safety. The voice-activated alerts of the Kidde KN-COSM-IBA alleviate any confusion when it comes to dealing with different warnings. This technologically advanced protection unit not only alerts by voice command, but also through LED warnings for the hearing impaired. Each voice in the Kidde KN-COSM-IBA system corresponds to a different disturbance and is followed by a series of alarm beeps and LED flashes. 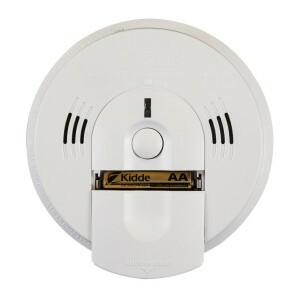 In the event of a false alarm, the Kidde KN-COSM-IBA comes with a Smart Hush system to silence alarms temporarily. The Kidde KN-COSM-IBA can function as a lone unit through a 9V battery or as part of an interconnected system of up to 24 Kidde devices. The unit also comes with easy installation methods. Simply adjust mounting brackets for optimal installation and mount the detector as is. The Kidde KN-COSM-IBA features a new and improved design for product performance at installation and over the lifespan of the alarm. In addition, tamper and theft-resistant alarms ensure that your device is always functioning at its highest level. 10 year alarm life, 10 year warranty — alarm lasts 40% longer! Peak Level Memory Announces CO previously detected" if alarm had detected a CO level of 100ppm or higher since it was last reset. These combination smoke/carbon monoxide detectors are very reliable. I never had any problem with them so far. Cheaper here than the big box stores.